I’d put this off for a while but I now have a spare wheel but no place to put it. 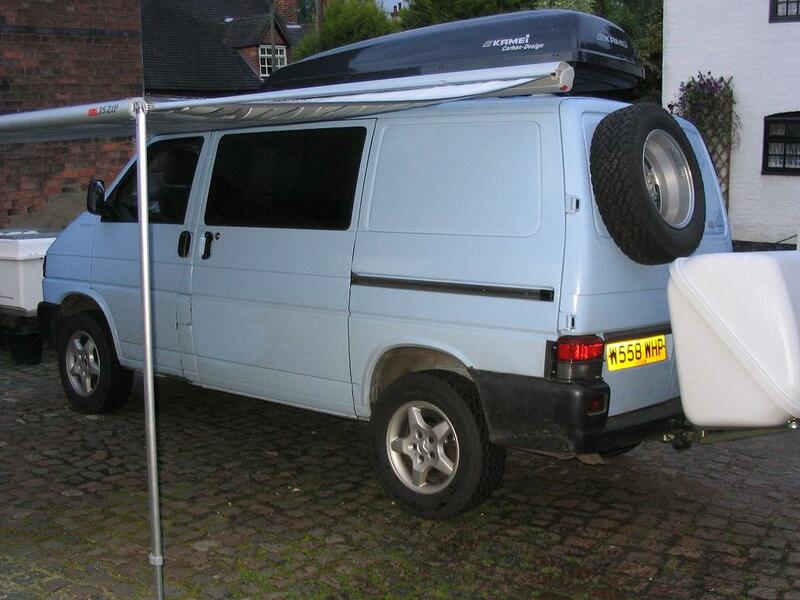 When my T4 was a panel van rather than a camper the spare wheel was located on the passenger side wheel arch. This is because on the SWB T4 Syncro there is no space to mount a spare wheel under the van because of the rear diff. The options are to a obtain an offical VW carrier, strap the wheel to the roof or do something else. I priced up all the bits for the VW carrier and it was nearly £800, so that is out of the question. Chucking the spare on the roof was out of the question as I don’t really have the space once my bikes and spare wheel are up there. 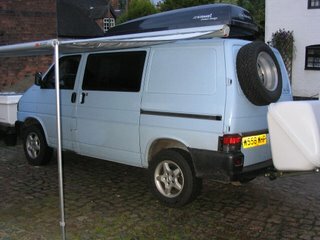 So I bought an EMPI stainless steel spare wheel mount for a VW T2 from just Kampers for £18.95. (PN J10552) I think these are normally used on a T2 to mount the spare to the front of the van but I intended to bolt this to one of my barn doors. I know this is normally frowned upon as its not good for the hinges. However the door has some locating pins in the centre and the spare wheel weighs only 25kg which isn’t much compared when you hang some bikes off the back. The bolts on the spare wheel mount were to short for the Merc ML Alloy so I cut the welds and removed them and then welded some longer stainless steel bolts in there place. I then cut a 3 mm steel plate to fit behind the top of the barn door and bonded the plate to the inside of the door with Sikaflex. I then bolted the spare wheel to the door using 6 m6 stainless allen bolts, these of course passed through the reinforcing plate on the door. I left the Sika to cure overnight and the next day I mounted the ML Alloy to the plate using some rubbber spacers and some washers. I’m sorry I didn’t take any pictures during the process but here is a picture of the finished article which was taken at a later date. The only problem with mounting the wheel this way is that it makes the door a little bit heavy but I don’t use it very often so its not a problem.